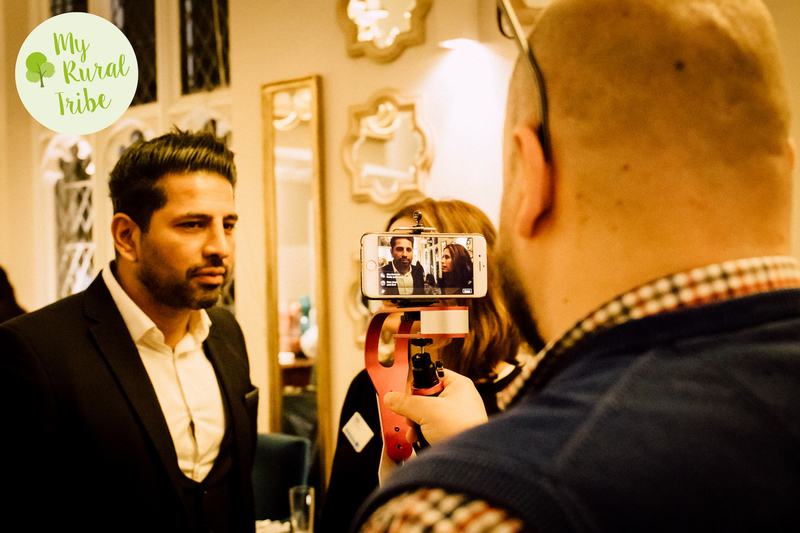 As with a lot of networking groups, 4Networking meetings are better busy than quiet. That’s my opinion and one that pushes me to have a big meeting. In fact it’s pushed me to have the number one meeting in the UK for most of 2016. I enjoy the energy of a big meeting and it really does help businesses in the room (mine and theirs). So, these tips are designed to help you to create that buzz, that energy, and that busy room. I know there are some meetings with eight people in that are great, I’ve been to them. But that’s not what I wanted to do at Leamington ‘Bloody’ Spa and ultimately that won’t help the network longer term. 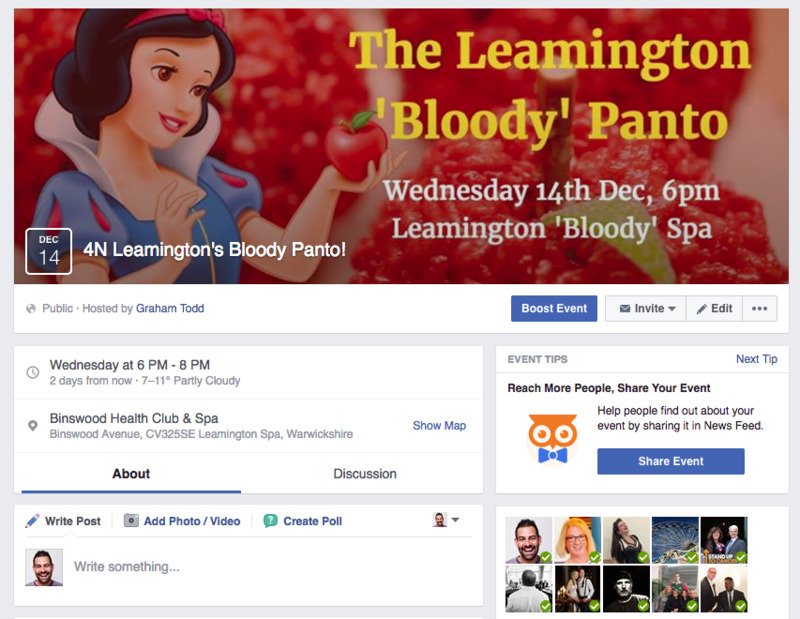 Firstly though… why was it called Leamington ‘Bloody’ Spa? Each year there are two area leaders’ conferences. Area and Regional Leaders meet up for a full on day of training and learning. Earlier this year myself, Claire McTernan (RL) and Samantha Rollins (AL) were invited to share the journey of Leamington Evening. Basically, you can’t hide from the noise of Leamington Evening and that’s what we’re all about. Hype, noise, numbers and getting our message out there into a busy world. Each meeting is an event, an occasion, and as many people as possible will find out about it via the marketing and word of mouth. At Leamington I like to think we’re intelligently loud. We’re not shouting louder than everyone else. We’re not simply making the same noise as everyone else. We’re using everything at our disposal to make the right noise, the different noise and the ever–changing noise to promote our meeting. When something stops working we move onto the next idea, and although some of what we do still remains un-matched, lots of our ideas have been snapped up by other groups – so we simply move onto the next thing. In your group (and your business) you need to know when to stop doing something and re-invent yourself. We accepted the LBS tag and used that as our brand. Everyone else was calling us that, so why not wear it proudly? Caroline did! We also accept that some of our marketing won’t always work so we constantly work to change it. I’m well-known for being quite passionate about people not showing. Back in the summer I shared a video in the community Facebook page urging folk to either turn up or cancel with the team. But do you know what? It happens! I’ve not turned up to a meeting before AND I’ve missed a 4Sight. That’s not to say I accept all the no-shows as I always call, text or send apologies, but it happens – I get it. If you want a big group you have to accept this and work on the 40+ rule. 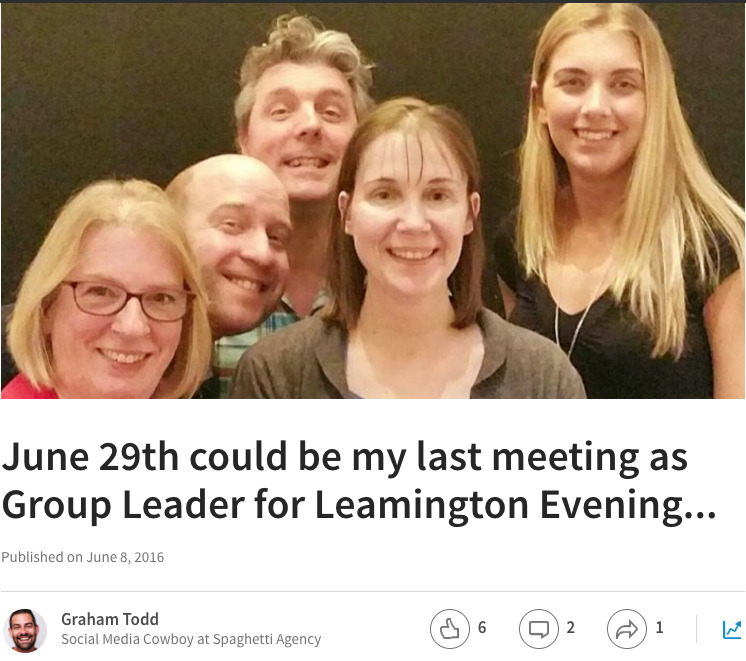 At Leamington Evening we accept that we might lose up to 10 per meeting (our record is 26 cancellations!) so we make sure we’re constantly booking people in after they’re interested in our meeting. We aim for 40 to get 32. That’s the LBS algorithm. We’re not blindly booking folk in though. We’re making sure we have 40+ seriously interested people booked so we have a buffer. If you just book 22 and hope for flagship, then it gets stressful and tough. Jay Deeley was “The worst Group Co-ordinator in 4N”. Well, at least that’s how I use to introduce him to the room each fortnight. Jay was bloody awful at the admin side but he took some phenomenal photos and when we relaunched back in November 2015, Jay made the meeting a photoshoot and that became the norm. Jay was so bad at co-ordinating (which he’s happy to admit!) that we moved him to the marketing role. He was effectively doing that with his photos. But those photos made LBS what it is today. You need photos! In your business and your group. You need to show people what your meeting looks like and show the emotion on the faces of the people in the room. Not everyone is as lucky as Leamington to have a professional photographer. But when Jay ‘left’ 4N (I’m not going there!) we asked the lovely Sian Mercer to take over his role. She’s a pro photographer too and is doing a fabulous job. For me it’s a no-brainer for a photographer to show off their talent like this. 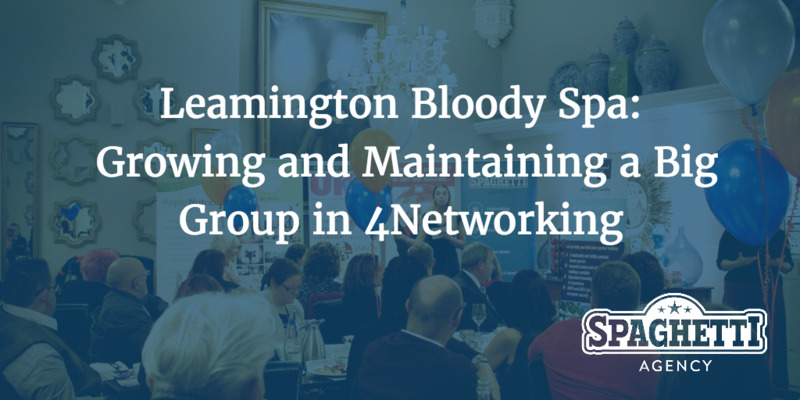 Think outside spamming the 4N website and Facebook group with a booking link. Everyone does that (we need clever noise, remember?). I’ve always created content around Leamington. Make content that others will want to read. “We had an amazing meeting” is OK.
“I can’t believe what he did with that paperclip” is perhaps more intriguing. “Possibly the best 4Sight we’ve had [includes photos]” is even better. I created a blog recently about LBS, and published it on our Spaghetti website. 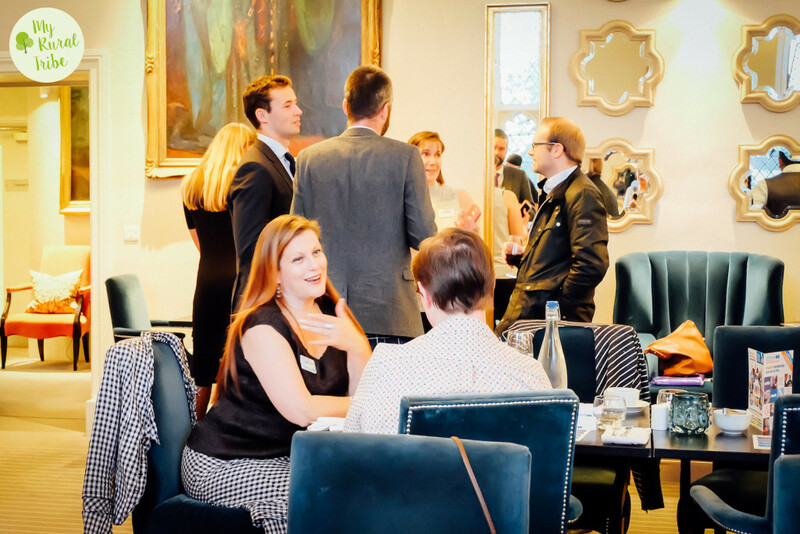 The blogs from the site go out to our list and the “8 Reasons Leamington Spa Evening is THE Place to Network” got us 12 more visitors and some more passporters booked on. Create content about your meeting and think outside the box. We also had two piece of PR this year too when we became the best group in the UK. Local press love that kinda success stuff. From the very beginning I’ve been creating Facebook events for the meeting. Events on Facebook are free and simple to set-up and you can add photos, content and video to each one. We create a simple graphic for each event and make sure that that graphic is used elsewhere to create the ‘brand’ of that one meeting. By creating an event you’re getting into the mindset that you’re running an event not a meeting (more on that later) and you’re also able to invite people. Using the invite option on a Facebook event is just one more touchpoint, just one more bit of content, one more bit of noise and a little reminder to your members and visitors. 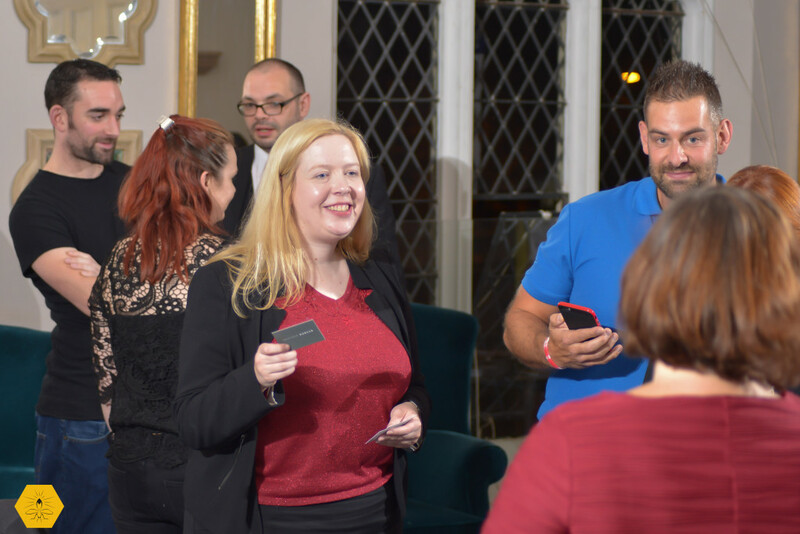 Get friendly with your networkers and get your team on board to help with inviting their friends too. Don’t spam; select. 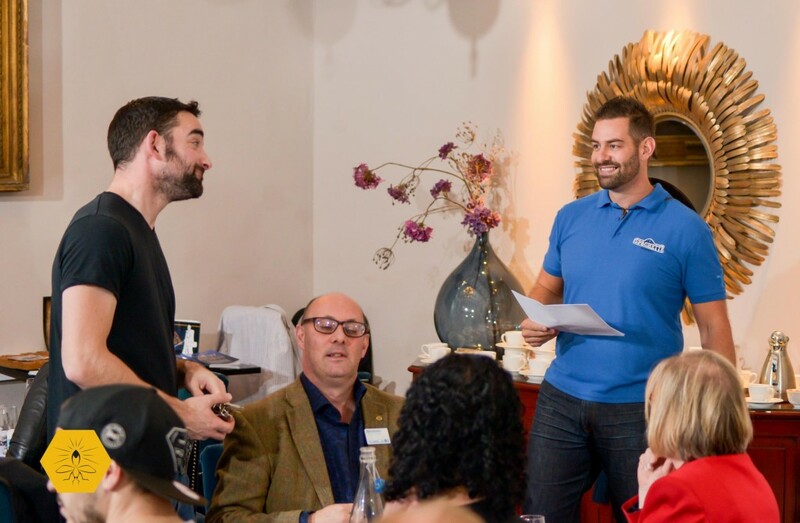 The 4Networking hashtag is #4NWorks. 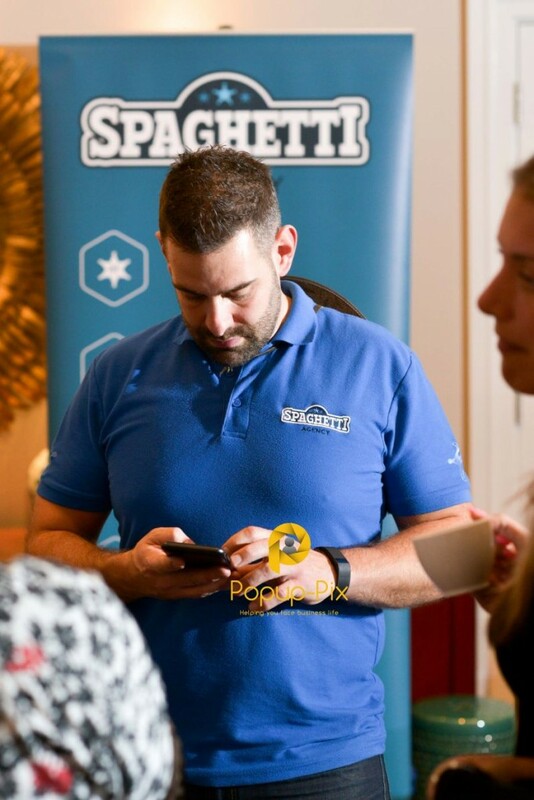 I track that hashtag for 4N as I run the 4N Twitter handle, @4NHQ. If you share great content on Twitter with that hashtag I’ll share it to our 9,000+ followers. Twitter is nowhere near as easy to gain traction on now so during my meeting I live tweet the advice from the 4Sight speaker (adding the hashtag) and I share photos and short videos (also adding the hashtag) to give me more of a chance to be heard. More touchpoints, more noise, more Leamington ‘Bloody’ Spa! Over the year I’ve also published a few articles on LinkedIn about the meeting. These are mostly re-purposed from other content I’ve created on Facebook or on email. The reason I use LinkedIn is that there’s a different audience there and most people will be notified when I publish my content there. The articles on LinkedIn also go viral much more easily too. You probably have a lot of connections on LinkedIn who don’t know that you run a group or who don’t know that they might like to join one. This has been one of the main parts of the marketing for Leamington. Having a strong email game is important in this busy social media world. Email still works and people still open them. I share valuable, useful content and use email to gently remind people around all the other content I’m sharing. I’ve built my email list purely from the people who attend the meeting. 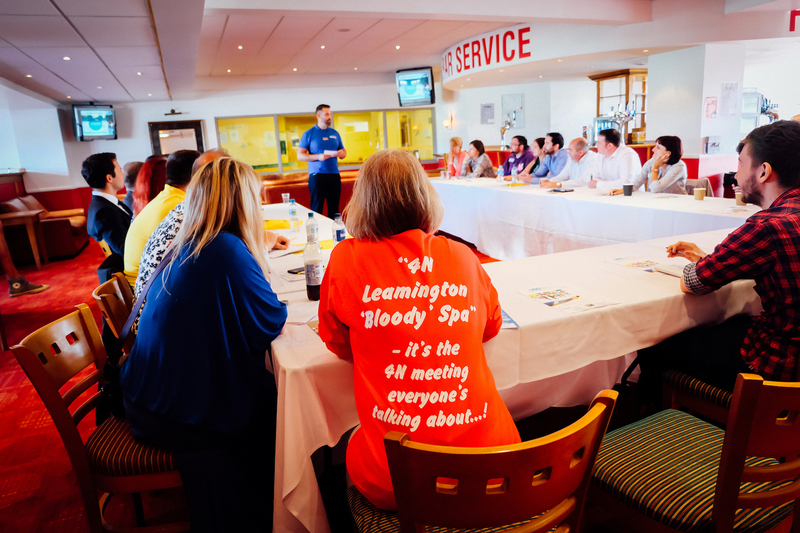 When you sign up to 4N you agree to be contacted occasionally and that means you can contact members and visitors to your group about 4N. Don’t use the list to market your business or other things; that’s illegal! I share the tips and insights from the 4Sight speaker (from the live tweets) and I share photos and some other info or news from the meetings. It’s all aimed at reminding people what they missed or what they experienced, depending on whether they came or not. We email once a week and I’m religious about it. That email gets a 30-40% open rate from the 450 people on the list. That’s more eyes and more interest in my meeting. It’s not a “Come to my meeting” email, it’s a “You really MUST come to the next meeting” email. We can talk about the fear of missing out… because you really are missing out if you’re not at our meeting. 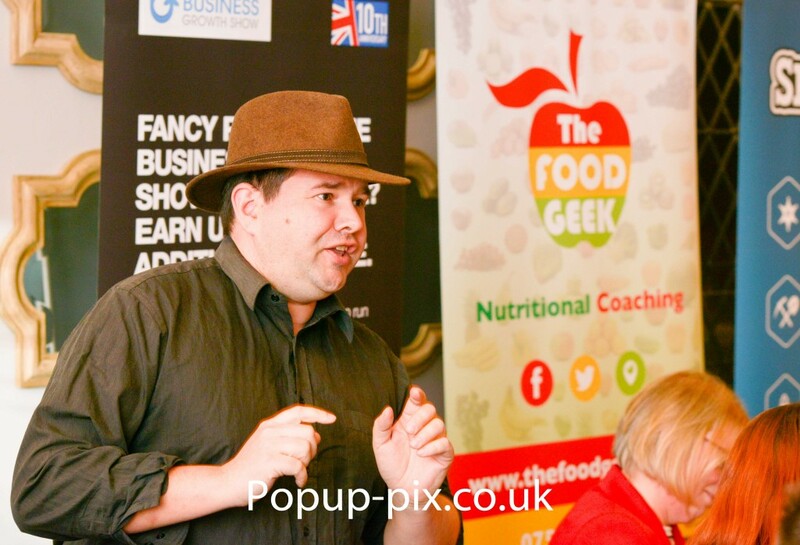 Aside from online marketing I also go to other 4N meetings and other networking meetings. Just this week I’ve been to two 4N meetings and I’ve booked on four people from those meetings. I merely mention that I’m GL at Leamington and what’s happening during my 40 seconds, during the meeting roundup, at the end, during my 121s, and open networking! 4Sighting as a team member in other groups is also a great way to build your profile and the profile of the group. You’re like the Mick Jagger, the front man of your group, if you play it right! I find that if I get people to my meeting they convert better so I’m talking a lot about my meeting at other meetings. It helps my business thrive, and my meeting too. If you’re familiar with my meeting then you’ll know it’s a who’s-who of 4Sighters. This year I’ve made no qualms about the fact I only have the best. I decide who the best are and so does the network based on the noise around them when they present. The 4Sighter brings a crowd and that’s given me anywhere between 1 and 15 bookings solely on the merit of the speaker. You literally can’t 4Sight at my meeting unless you’re booked in advance. Like, I’ve shut the door. We have bookings up until 2018! Yup, stupidly advanced but I’m planning the meetings far ahead so that we can plan the marketing and never ever ever have a blank gap or a TBC as a 4Sight title. I’ve actually applied that rule to the #4NTVLive list which I look after. No title? No description? No booking. I hassle my 4Sighters months in advance for their talks as it’s essential for the marketing. If you can’t help promote it then you’re not much use to me. Harsh, but it helps the 4Sighter too, so I rarely come up against any issues. Don’t book crap 4Sights. That’s my rule. I want the biggest part of the meeting that I can’t control to be a winner. Think about it. It’s the one section of the meeting I don’t control as such. That 4Sight speaker gets the room and they get to run the energy and the motion of the meeting. If they’re flat, poor, lacklustre or they give a naughty sales pitch then it ruins the flow of the meeting. I MC a lot of events and I understand that value of keeping the flow of an event. You might not feel that flow the way I do but just accept that it does change the flow of a meeting. Anyone who was at the Jamie Denyer meeting will know about that (in a powerful way!). Great 4Sighters add to your meeting; they don’t flatten or kill it. I don’t read the script. Yeah I said it. Honestly… if you stand in front of a room and read off some paper you’ll lose them. There are some really key points in that meeting script and I make sure they all go out. I mark the meeting script with highlighters at the key points and changes. When you present, you’ll want to look up but then when you look back you’ll need to know where you are. Highlighting the sections makes this very simple to do. I read the script… but I don’t read it word for word. I follow it, I present it and I get the marketing points across to the room. I fully accept that many will have heard it 100s of times but I’m also aware that I have new people in the room too who’ve never heard it. Once, John Clapham hid my script and I still ran the meeting as I would’ve done with it. Planning works. I read the script before each meeting to keep it fresh in my mind for when the unexpected happens. Keep the pace going on the 40 seconds round. There’s so much opportunity here for the meeting to fall flat too. Keep the pace with good introductions in between each 40 seconds and choose a good presenter first. It’s in the script but it’s not always done. It makes such a difference. You need to know your venue, the catering staff, the parking, the toilets, and everything in between. When you’re running an event you need to be right on top of it all so that when your 4Sighter suddenly needs a flipchart or an extra table you’re right on it, or when a surprise visitors turns up you’re able to seat them and feed them quickly, without making them feel bad. It happens, so be ready to make it work. I quickly realised that people were getting forgotten. If you come to a meeting you’re asked if you want to be booked on next time. That’s great (although this can cause cancelations later) but what if you don’t come next time? Or the time after? You’re going to go off the radar. I actively go through the list of members and visitors and re–invite people who’ve not been for a while. We don’t have a big ‘core’ at Leamington Evening. As in, we don’t have a lot of people who regularly come along to the meeting. We get a lot of passporters and a lot of visitors. We’re working on building that core but for now but it’s a big task each fortnight to keep people coming. By using the data from the ‘Your Team’ page you can really gain some ground on numbers. Communication is so key to a successful group. During writing this we’ve just realised that Sian wasn’t booked on (because she wasn’t at the last meeting). So even the team can get missed off sometimes! If you’re not using a CRM in your business then you need to. Stop reading this and go and sign up for one now. Honestly. Our CRM runs our business and our client comms. It keeps us in the minds of the people we need to be and makes sure we don’t miss someone who was interested. I’ve applied this to LBS. If I book you in you’re booked via email or social. I stick you in my CRM and set a reminder to ask you what you thought about the meeting after the meeting (this can sometimes be four weeks away). This ensures that I contact my visitors and see how the meeting went, or if they cancel it reminds me that they didn’t come along and that I need to re-engage. Making sure you don’t forget your members, passporters and visitors is key growing a group. There’s a great CRM called Sales Radar which is built and designed by Steven Timberlake (Our Area Leader). Check it out… it’s got some great tricks in there too! Your team is a team. I always find it amazing that some teams don’t talk between the meetings. Honestly; I’ve had three messages whilst writing this. We’re constantly speaking about bookings, visitors, numbers, 4Sights and more. Keeping in contact makes your team stronger and helps to grow your group. We use Facebook Messenger to keep in constant contact and I know many others do too. Share your thoughts and news to keep it strong. I also linked-up with the other group leaders in the area. We had a group chat going with myself and Gary Jones (Leamington Lunch) and Kirk Pickstone (Leamington Breakfast) to share ideas and visitors and more. If I couldn’t get someone booked into my meeting I would get them booked in elsewhere. We’d also share ideas, stories and findings to make ourselves accountable, stronger and better in our role. This worked really well and helped all three meeting become flagship at one point. We didn’t ever get them all flagship at once (there’s always next year!) but all three groups have also been top 20 at some point too. If you look at this top 20 list then you’ll see quite a few Midlands groups in there. It’s certainly catching, this big group thing. I know for certain that the NEC and the Coventry meetings share a lot of their members and passporters as I did with Rugby at the time or writing this which used to run on the same day as mine. Running a group isn’t a competition with your other groups in the area – it’s one big team effort! Running a big meeting is hard work. There, I said it. It’s not something you can spend 10 minutes on a fortnight. I spend about an hour a day on ours. Yes, 10 hours per fortnight. Why? Because I want a great meeting because it looks good on me and my team. I run a marketing agency. How stupid would I look if no one knew about my meeting? If you’re a business owner then you’ll look so much better with a successful meeting than a failing one. In the summer of 2015 our group had an embarrassing four people at it. Don’t let that happen. Get your team’s heads together and get a marketing plan sorted. 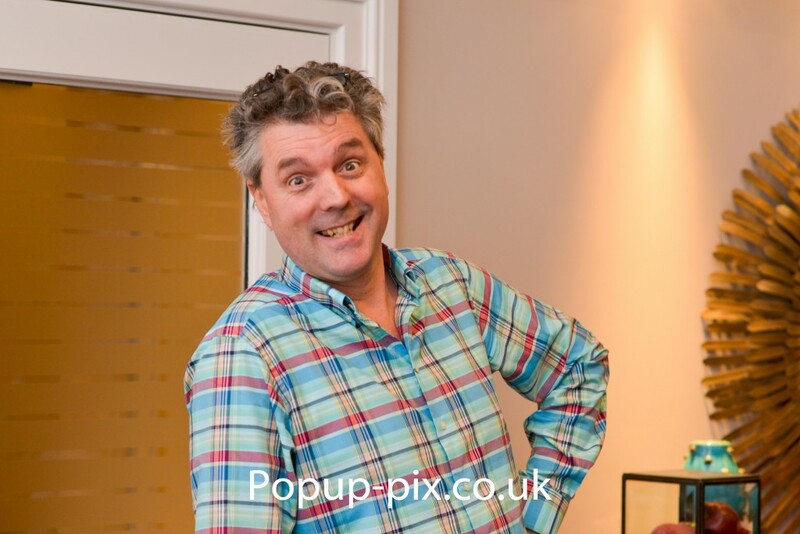 Use a CRM, some social media and go to other meetings and shout about yours. 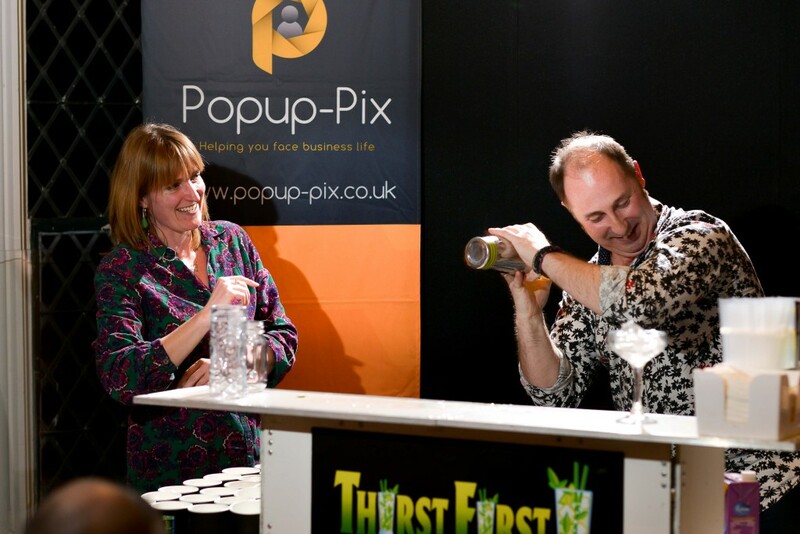 Make your event a show with the best 4Sights and a great running order.